On Sunday, June 10, from 1 to 4 pm, the Friends of Goodale Park will present a free garden tour featuring 9 neighborhood gardens, 4 smaller charming parks, and special attractions in Goodale Park . Guest speakers will give presentations with information of special interest to urban gardeners. Presentations will be held in the courtyard of the Caretaker’s Residence located in the center of the park. 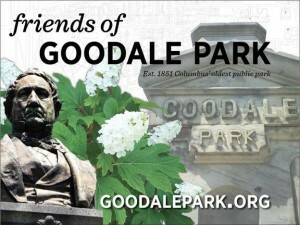 Maps will be available to guide visitors to private gardens, attractions in Goodale Park, and 4 smaller Short North parks. Join in a garden scavenger hunt! Find all the unusual fauna and flora on the scavenger hunt form provided, return it to the last garden you visit and be entered in a drawing to win a prize. Watch the Tom Wood show on NBC 4 Saturday morning June 9 from 7:00 to 9:00 for a sneak preview of the gardens!